On May 18, 1968, 24-year-old Palestinian Sirhan Sirhan sat in his room in Pasadena and wrote repeatedly in his notebook, ‘R.F.K. must die – RFK must be killed Robert F. Kennedy must be assassinated… before June 5 ’68’. JFK’s younger brother was running for President on an anti-war ticket, the great white hope of poor black communities torn apart by rioting in the wake of Martin Luther King’s assassination six weeks earlier. On June 4th, Bobby Kennedy won the all-important California Democratic primary and looked set to challenge Nixon for the White House. After a rousing victory speech at the Ambassador Hotel in Los Angeles, shots rang out in a kitchen pantry. Witnesses saw Sirhan firing his gun several feet in front of Kennedy and he was convicted as the lone assassin. But according to the autopsy, the fatal shot was fired from an inch behind Kennedy’s right ear, suggesting a second gunman was involved. My new feature documentary, RFK Must Die, explores the controversies surrounding Kennedy’s death. How could Sirhan have fired the fatal shot if he was several feet in front of Kennedy? Who was the girl in the polka-dot dress seen with Sirhan in the pantry who later fled down a fire escape, exclaiming, ‘We shot him! We shot him!’ And why has Sirhan never been able to remember the shooting? At first, these struck me as intriguing ingredients for a screenplay but during my research, I discovered new video footage of three alleged CIA operatives at the hotel that night – men who had previously worked together on plots to assassinate Castro. I pitched BBC Newsnight and they commissioned a twelve-minute film to find out why these men were at the Ambassador Hotel that night. So began a long and very odd journey as a first-time investigator into sixties conspiracy. The Newsnight piece and a Guardian article led to a US distribution deal for a feature documentary and a book to be published on the fortieth anniversary of the assassination in June. At the heart of the mystery is Sirhan himself. At 5’2″, he trained to be a jockey but a bad fall from a horse left him on the dole and increasingly disillusioned. He got into mysticism and started hypnotising himself in his room, practising ‘automatic writing’ – repeatedly writing down his goals, to help make them come true. But what led him to write ‘RFK must die RFK must die’? Since the early fifties, the CIA had been trying to create a hypnotically-programmed assassin, a real-life Manchurian Candidate who could be trained to kill with no conscious memory of being programmed. Dr. Herbert Spiegel, America’s leading expert on hypnosis, believes this is what happened to Sirhan. Today, Sirhan is still in the same California prison as Charles Manson. He told me he feels trapped in a Kafkaesque world, imprisoned for a crime he doesn’t remember. Now, a new audio recording of the gunshots has emerged. Sirhan’s gun held eight bullets but audio experts have concluded there are thirteen shots on the tape, suggesting Sirhan may well have been a decoy for the real assassin. 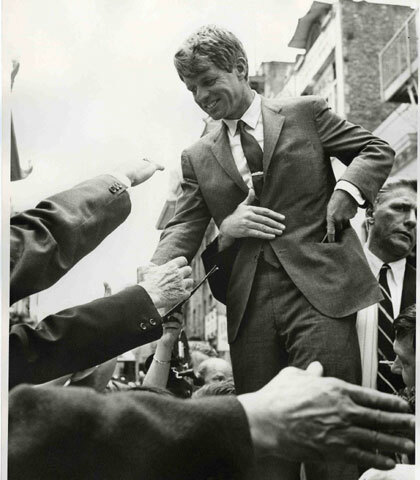 RFK Must Die screens in the East End Film Festival on April 23 and is released on May 16. Who Killed Bobby? The Unsolved Murder of Robert F. Kennedy will be published in June.